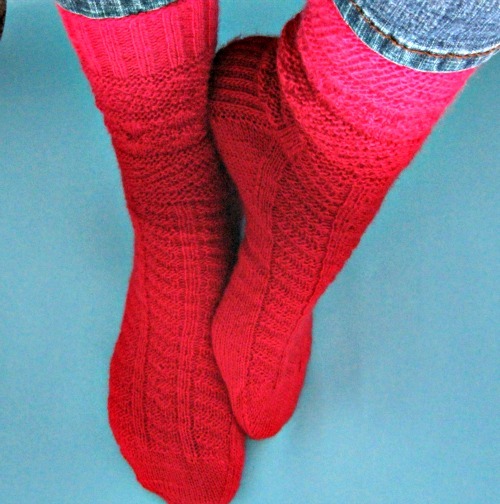 Aah, ich hatte solche guten Vorsätze, mit Hilfe von Ravelry’s sockdown jeden Monat ein Paar Socken zu stricken. Oktober und November hatte ich ja auch noch geschafft, aber dann war Sense, weiß eigentlich auch nicht, warum. Hier sind die beiden Paare Socken, die dann doch noch von den Nadeln hüpften. Das Muster besteht nur aus rechten und linken Maschen, ist also ganz einfach – und trotzdem nie langweilig. Habe mir dafür Schoppel Wolles Zauberball in der Farbe “Heißes Eisen” ausgesucht, auch wenn es keine Sockenwolle ist. Die Socken sind so richtig schön fluffig geworden und wunderbar warm. Definitiv heiße Eisen Socken! Anleitung (englisch) hier. 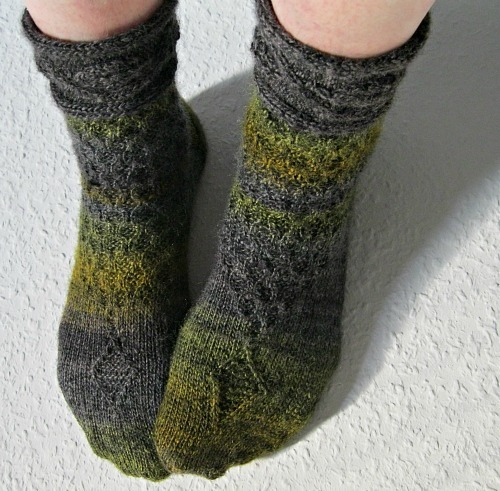 * Well, I was full of good intentions to knit one pair of socks every month as part of the sock down challenge on Ravelry. I managed to keep up in October and November, but that was it. Don’t really know, why. 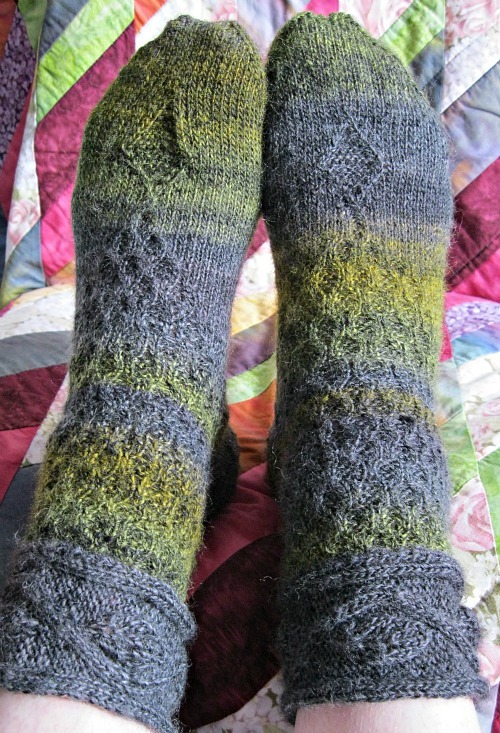 So the socks I did finish you can see above. First there’s Herbstlaub, which in German quite appropriately means “fall foliage”. You first knit the cuff horizontally and then pick up the stitches for the leg on the side of the cuff. The pattern on the leg is basically a cable over two stiches which can be knit without a cable needle. It’s a beautiful and fun pattern. Find it (in German) here. The red pair was the sock down mystery sock for November. I picked Schoppel Wolle’s Zauberball in the color “Heißes Eisen”, which literally means “Hot Iron”. It’s not really a sock yarn, but it came out so nice and squishy I won’t mind washing these socks by hand. And they really are warm! Find Erica Lueder’s free pattern here.